So, today we woke up to huge, beautiful snowflakes falling silently to the ground. We were so excited, and couldn't wait to get the girls outside for a snowy picture-taking frenzy! 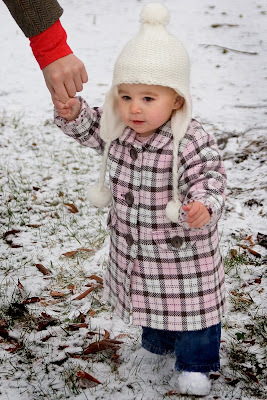 This was Chloe's first snow, and Eleanor's second, but her first as a big girl and first at the new house. We only kept them out for a minute, but managed to get a few cute shots. Also, I just have to mention that Eleanor's spiffy new pink and brown coat was the deal of the century! I got it last night at H&M for 12 dollars and 45 cents. And, of course, I think she looks totally adorable in it! 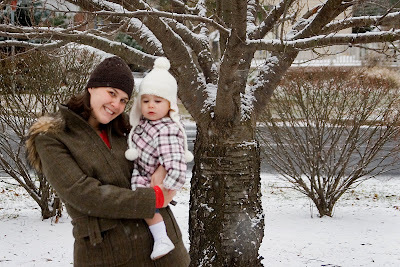 AND I thought it would be really funny to cram Eleanor into last year's snowsuit (which I was so right about) and do a little reenactment from her first official snow. 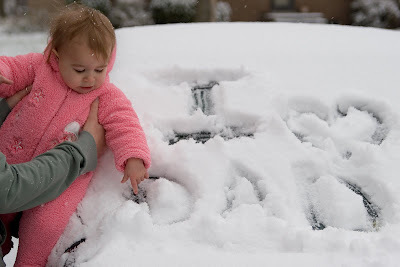 I think the new one looks like she was writing the words with her little, frozen finger. This is for you, Daddy. So cute! 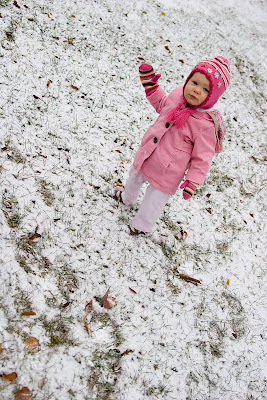 We had our first snow today too. I love the comparison of last year to this year! Aw, I bet he will really like this. That coat and hat are super cute. I wish they had it in my size for that cheap. SNOW... don't think we will have any of that for a while. Who knows though... anything can happen in Texas. I love Eleanor's coat. Do they make it in my size? So cute and that coat is AWESOME!! Love it Love it Love it!! WHere did you find that adorable coat?? We had a little bit of snow here but we haven't ventured out in it yet. Looks like she's having some good times@! We're getting a little snow here right now. I love snow! 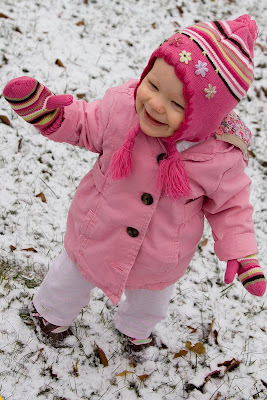 Adorable snow pictures!! It is snowing today.... but not very much! Could E's coat be anymore stylish? Of course it helps that her mom has great taste!